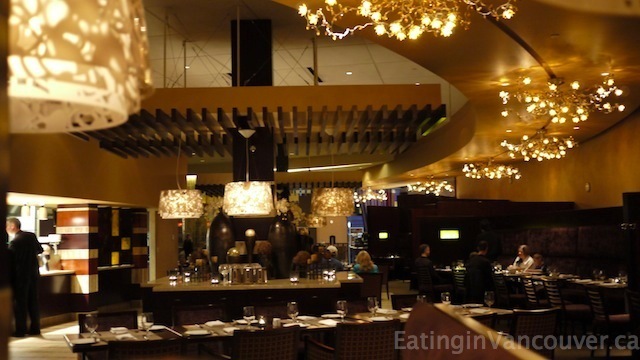 EBO Restaurant, which stands for East of BOundary, is located at the Delta Burnaby Hotel Burnaby, adjacent to the Grand Villa Casino. This brilliant fine dining restaurant is where local ingredients find a fresh direction and new boundaries. EBO possesses symmetry and harmony between Executive Chef, Vintner, and local food producers – sharing the same passion for quality, creativity and local sustainability. EBO is eclectic, modern and sleekly designed with warm rich colours. Cozy plush banquettes and semi private tables enclosed with sheer silk curtains create an intimate atmosphere. We have a history with Delta hotels and Executive Chef Daniel Craig. Gary has known Chef Craig since their days at the Delta Victoria, back when Daniel started his apprenticeship there. Gary’s role in the banquet department worked exclusively with the same kitchen as Daniel. It was there Gary and the entire staff at the Delta Victoria took notice of Daniel’s culinary skill as he was consistently placing in the top three of culinary challenges, such as the Grand Marnier Dessert Challenges in 2004-05 and Knorr Junior culinary competitions. Daniel’s success in his early days at the Delta Victoria would culminate onto the world stage, when he took home the gold medal and placed 1st at the 30th Annual Concours International des Jeunes Commis Rôtisseurs in Adelaide, Australia, in 2006. It wasn’t until we moved to Vancouver did we meet up with Chef Craig when he was representing EBO at the First Annual Vancouver Foodie Feast, put on my Sherman and Mijune. 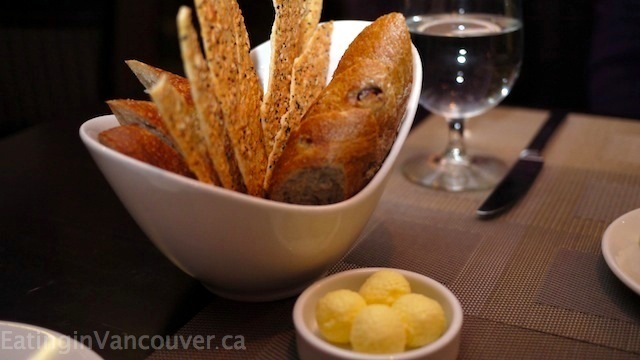 When Chef Craig and his wife Shanna (whom Gary also worked with at the Delta Victoria for years) invited to host us at EBO and Delta Burnaby, we were more than eager to visit and re-connect. We started our evening with a couple cocktails off the bar menu: Orange Mojito – Rum, Mint, Orange Juice, Simple Syrup & Soda and a Sizzling Caesar – Gin, Clam Cocktail, Cucumber, Franks Red Hot Sauce. 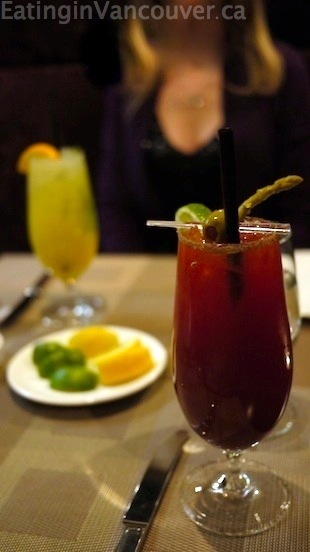 Gary loved the addition of both the olive and pickled asparagus in his extra spicy caesar. 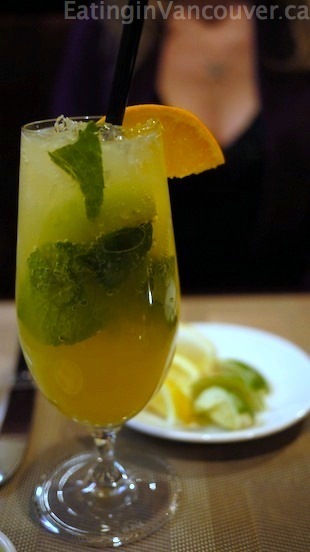 The mojito was nice and strong and certainly packed a punch! Even though we took a quick look at the dinner menu, it wasn’t necessary since Chef Craig personally tailored the menu for our evening, serving us his suggestions. We didn’t know what would be in store for us but were certainly excited to taste his creations. Bread service included potato rosemary baguette, black pepper and parmesan cheese cracker bread in the middle, along with an apple cranberry bread. This bread wasn’t your typical run-of-the-mill started bread–it was actually freshly baked at EBO and had a hearty crust, and the inside was soft and pillowy to the touch. Butter was served at room temperature, allowing it to be easily spread. Some places like to serve butter straight from the fridge, which makes it difficult to spread. Chef Craig personally presented us with this stunning amuse bouche of savoury lollipops consisting spot prawns with a classic cocktail sauce and lemon aioli. There was also house smoked salmon belly, Philippine Longanisa sweet sausage, and cocktail tomatoes stuffed with verata goat cheese and topped with balsamic caviar. 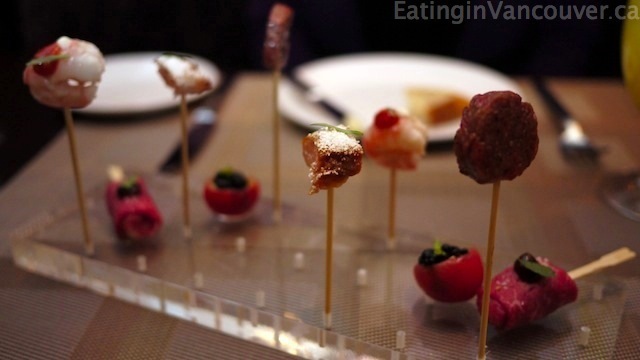 The presentation looked immaculate, and these were a joy to ‘pop’ into our mouths. 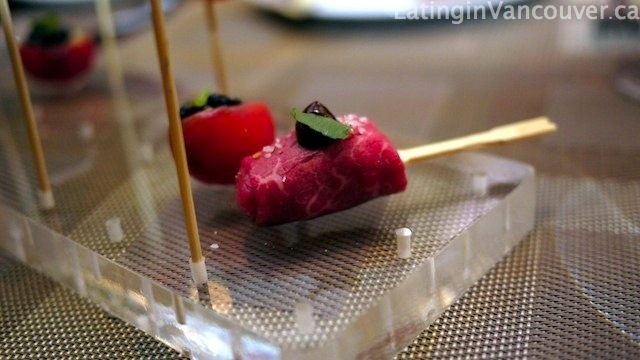 Wagyu beef, eye of the round cut, lightly seared, thinly shaved and then wrapped around enoki mushrooms, fluid jelly of ponzu, and garnished with cilantro. This bite speaks for itself–it’s wagyu beef! It melted in our mouths. 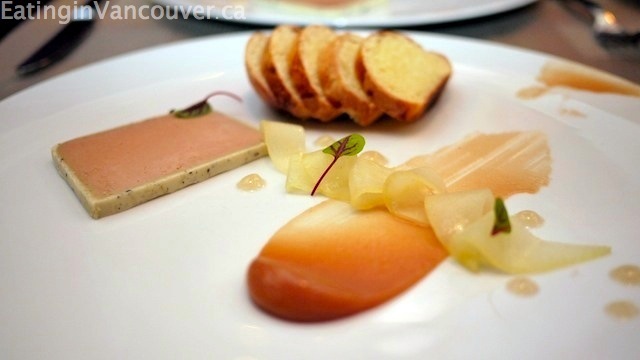 Pâté – Foie gras and chicken pâté served with warm and soft house made brioche bread, quince preserve smear, compressed pear in the centre, and topped with delicate microgreens. This dish was beautiful and tasted just as good as it looked. The pâté was creamy, luxuriously rich and silky smooth. Combined with the sweet brioche and pear, this dish was a match made in heaven. Beetroot & Goat Cheese – Marinated Hazelmere organic baby beets, Goat’s Pride Camembert from Abbotsford, pine nut granola, yuzu cloud oranges, orange foam, dehydrated cheese powder. The organic beets were delicious and bursting with flavour, and we loved once again experiencing a local product in the creamy camembert. 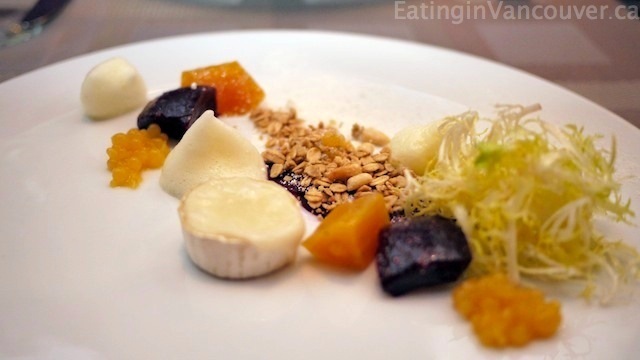 The use of molecular gastronomy in creating the textures of orange made this an enjoyable dish to consume. Scallop & Short Rib – Slowly roasted, 48 hour beef with a seared Oceanwise Quallicum Bay scallop, mushrooms, pomme puree, and house kimchi. This is probably by far our favourite dish of the night. The beef short rib is braised for an entire two days at 150°F in a Cryovac bag, and the final product is nothing short of outstanding. The beef was extremely tender, flavourful and melted in our mouths. This dish is a fusion play on traditional Korean BBQ of beef short ribs, and the perfect amount of house made kimchi had just the right blend of spice, as to not overpower the dish. 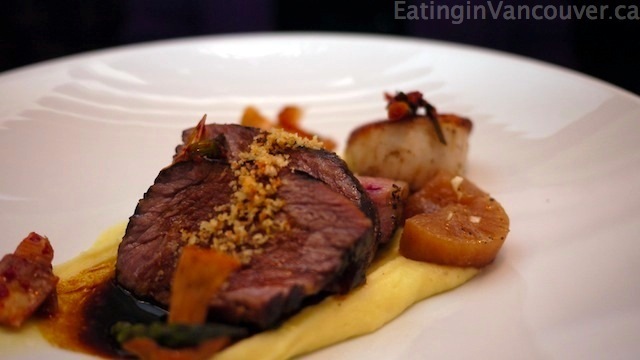 To kick this dish up another level, a nicely seared scallop complimented the beef short rib. 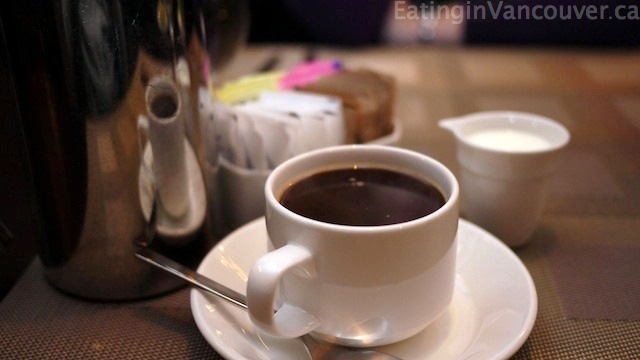 To accompany our desserts, we enjoyed cups of their Sumatra roast, 49th Parallel Coffee, that was served in a French press. Note to self: coffee after 9pm is not a good idea. 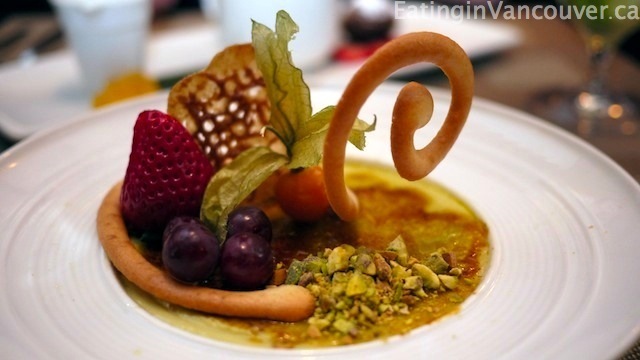 Chef Craig personally served us two different desserts to share, the first one being a Pistachio & Chocolate Brûlée – Pistachio crème brûlée on the outside and chocolate crème brûlée on the interior, topped with a spiral tuile, red grapes, sliced strawberries, gooseberry and crunchy pistachio nuts. The pistachio flavour was subtle and not overpowering, and the chocolate centre was a nice surprise. The top layer of caramelized sugar was thin, yet substantial enough to hold up the fresh fruit. The tuile was crispy and made the presentation of this dessert literally pop off the plate. 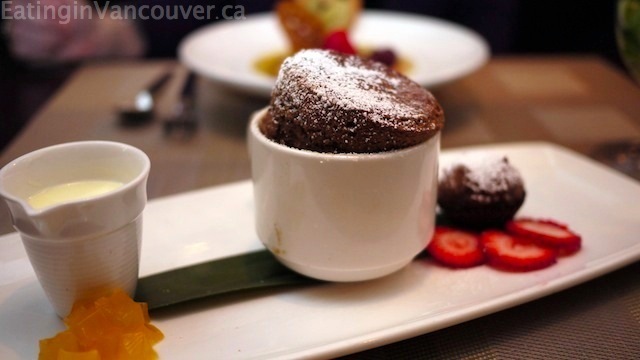 Classic Dark Chocolate Soufflé – Dusted with confectioners’ sugar and served with passion fruit gel, sliced strawberries, a side of creme anglaise, and a freshly deep fried chocolate beignet doughnut ball. Despite the fact that soufflés tend to collapse quickly upon removal from the oven, this one did not! Chocolate soufflé is the ultimate chocolate dessert and this dish explicitly requires at least 30 minutes of cooking time at EBO. Chef Craig couldn’t have capped off our night any better. The soufflé itself was light and moist with the perfect amount of sweetness, and the creme anglaise really took this souffle to the next level. 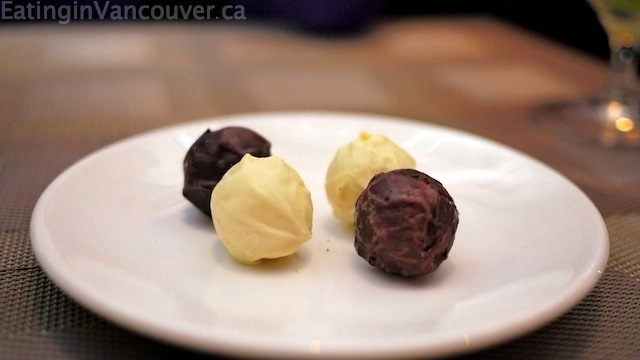 Handmade Truffles: white chocolate passion fruit and chocolate raspberry. Of course, after having being stuffed silly we were presented with some homemade truffles. Both flavours of truffle had a gooey inside, bursting with flavour. The tartness of the passion fruit was really evident in the white chocolate truffle. Both flavours were exquisite. 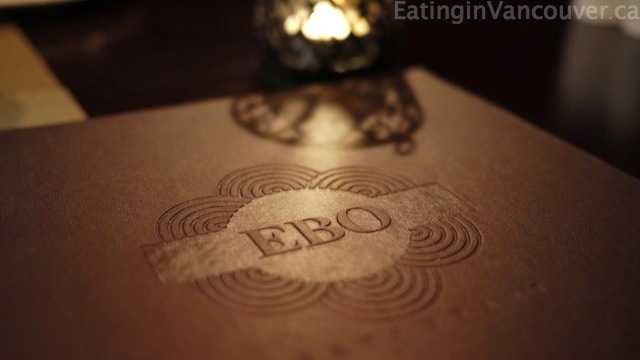 EBO Restaurant has been quite the talk of the town thanks to the incredible work of Chef Craig and his culinary team. The Asian fusion at EBO works because flavours within each dish are paired perfectly with fresh local and sustainable ingredients. Everything tasted superb with each bite we took. The presentation of dishes definitely set the bar high to go along with the innovative techniques used to cook specific items (48 hour braised beef short rib anyone?!). The consistent high praises of EBO are a testament to Chef Daniel Craig’s passion for food–something he first fell in love with during his early years. This has directly influenced his innovative dishes, and he will soon be off to compete at the Discovered Culinary Competition in Toronto the first week of March, after placing runner up at the recent 2012 BC Foodservice Expo black box chef’s competitions. Best of luck, Dan!